For Trump, the Problem Isn't the Message. It's the Messenger. 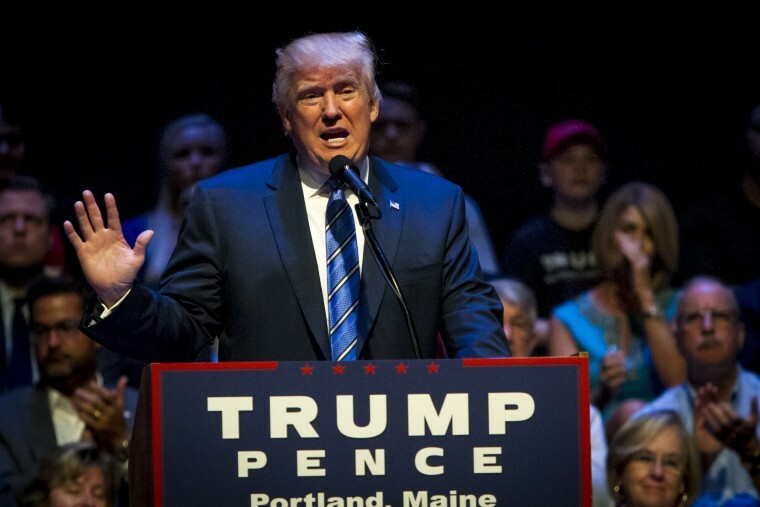 The 2016 presidential election has solidified into a referendum on Republican nominee Donald Trump. And it’s the man – not his message – that’s creating the stark choice that voters must make in November between two unpopular nominees. A new poll from NBC News and the Wall Street Journal shows that a broad majority of voters agree with Trump’s assertion that the nation is at a “moment of crisis” and that threats of terrorism and violence against law enforcement officers “threaten our very way of life.” Half of voters report wanting a shakeup in Washington. A slim majority – 53 percent – also say that law and order in the country have broken down, one of Trump’s top talking points in the weeks leading up to the Republican National Convention. And while the share of Americans who feel that the nation is headed in the right direction has ticked up slightly, more than six-in-ten still say the country is off on the wrong track, echoing Trump’s grim depiction of the future if he is not elected in November. Despite the public’s receptiveness to his tough-talking message, though, Trump still significantly trails Hillary Clinton – an unpopular candidate whose handling of a private email server scandal has left her wounded and mistrusted by voters – by nine points overall, 47 percent to 38 percent. “The messenger is just so flawed that the message, which may have some resonance, just can’t get through or can’t get through cleanly,” said Democratic pollster Peter Hart, who conducted this survey with Republican pollster Bill McInturff. Participants in the NBC/WSJ poll were given statements made by each nominee during their respective conventions, although neither Trump nor Clinton were named as the individual associated with the comment. Only thirty-six percent said the same of the second statement, which was made by Clinton in her address at her party’s convention in Philadelphia. But while Trump’s message appears to hit a nerve with voters that Clinton’s does not, the new data also show that almost seven-in-ten voters are anxious about Trump’s fitness to do the job. Asked how they would feel with Trump in the Oval Office, 49 percent said they would feel “pessimistic and worried,” while another 19 percent said they would feel “uncertain and wondering.” Only 16 percent of participants said that Trump has the right temperament to serve as president, and just 23 percent said they feel confident that Trump is knowledgeable and experienced enough to handle the presidency. Clinton, on the other hand, is viewed by 57 percent of voters as knowledgeable and experienced enough for the job, while 48 percent say she has the right temperament to serve as commander-in-chief. But the former secretary of state still suffers from dismal ratings when it comes to questions of trust. Only twenty-two percent say Clinton is honest and straightforward, compared to 56 percent who say she is not. Trump’s slide in the NBC/WSJ poll and other national surveys came after the GOP nominee was caught in a firestorm last week about his treatment of the parents of a Muslim-American soldier killed in Iraq in 2004. In our poll, 65 percent of voters said they had either major concerns (49 percent) or moderate concerns (16 percent) about Trump based on his criticism of the Gold Star family. While the result certainly offers a backdrop for Trump’s declining appeal with the public in the past month, it’s worth noting that voters are equally concerned by issues that have plagued the Democratic nominee since early in her campaign. Clinton is still dogged by the scandal arising from her use of a private email server during her time as Secretary of State. Sixty-five percent of voters say the controversy gives them major (48 percent) or moderate (17 percent) concerns about Clinton based on her handling of the matter. A similar share – 68 percent – say Clinton’s paid speeches to big banks and other special interest groups give them major (46 percent) or moderate (22 percent) concerns about her. Despite the continued weak spots for their own nominee, the new poll shows a sunnier outlook for the Democratic Party than for Republicans as the two parties come out of their respective conventions. President Barack Obama’s job approval rating now stands at 52 percent, his highest since his second inauguration in 2013. Other Democratic heavyweights are enjoying high approval ratings as well. Some of the most popular figures measured in the poll were First Lady Michelle Obama (56 percent positive, 27 percent negative), Bernie Sanders (51 percent positive, 29 percent negative), Chelsea Clinton (32 percent positive, 20 percent negative), Tim Kaine (26 percent positive, 19 percent negative) and former president Bill Clinton (44 percent positive, 38 percent negative). The Democratic Party’s overall approval rating is 40 percent positive, 43 percent negative. That’s compared to a more sour rating for the GOP at 27 percent positive, 51 percent negative. Democrats are also more pleased with their nominee than Republicans are. Sixty percent of Democrats say they are satisfied with Clinton as their standard-bearer, while only 45 percent of Republicans say the same about Trump. Clinton has also shored up support among backers of her former rival, Bernie Sanders. Voters who backed Sanders in the Democratic primary now say that they choose Clinton over Trump by a margin of 86 percent to 6 percent. And enthusiasm from Democrats has fueled a significant jump in optimism about the direction of the country. In July, a total of 73 percent of all voters said that the country was on the wrong track, while just 18 percent said that the nation was moving in the right direction. In the latest poll, 32 percent expressed confidence that the country is moving in the right direction, a jump of 14 points. While Republican responses to the right direction/wrong track question have remained fairly stable in the last month, the share of Democrats offering an optimistic answer has nearly doubled since July, jumping from 33 percent last month to 58 percent now.